*I arrive at school by 7:05 each day and usually stay late. Now, I bet you want to know what this week's challenge is.....Today is my Granny's 84 Birthday!!! Happy Birthday Gran! So, in her honor, I'm challenging you to "Celebrate Life". This can be anything from baptisms, birth, birthdays, celebrating family vacations, to prom, etc. I decided to scrap a page of my Gran with Ashlea and Megan while my family was at the beach. 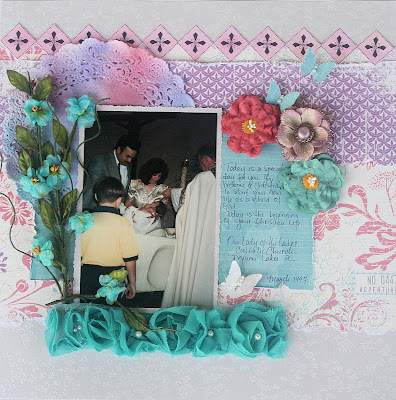 I simply adore this paper by Making Memories, I just added a hint of stickles to highlight the flowers and the beautiful blue birds. All supplies on this paper are Making Memories and Close to My Heart. Our Lucky Girl design team will be hosting a Blog Party from August 1-3 featuring daily project inspiration for the Old School Cool kit. 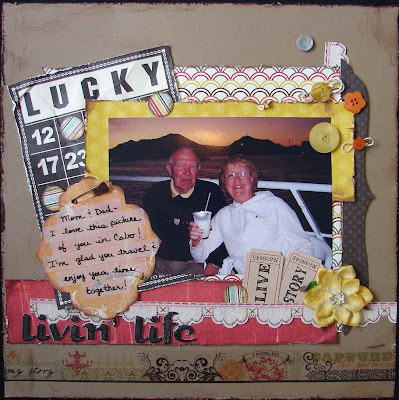 Be sure to check us out at http://www.luckygirlcraftkits.blogspot.com/. Check out what the rest of the Design Team did! Diana used a photo of her daughter Monica's Baptism as a symbol of celebrating hew baby daughters new life in Christ. 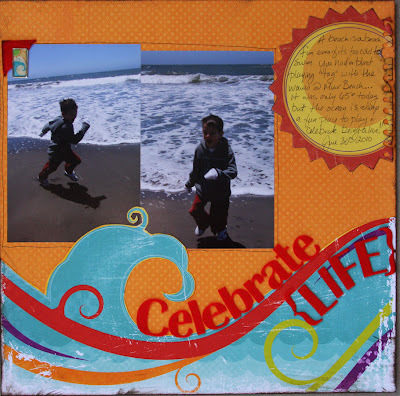 Joni did a simple layout with some fussy cutting on the blue wave paper and journaling about her son celebrating life at the beach playing tag with the waves and just being a boy. The white embossed cardstock Pat used made a beautiful background for this black and white layout. She did a fabulous job of letting the photo be the focus! Cassie interpreted this challenge by making a page about one of her passions. Cooking, eating and learning about food is one of the ways in which she celebrates life. Barb used a combination of her June and August Lucky Girl Kits to create this layout of her parents vacationing in Cabo. Since they have retired, they are certainly Celebrating Life!! 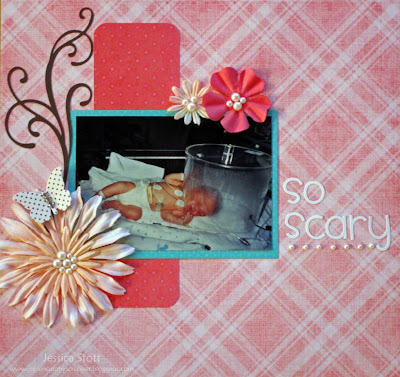 For her layout, Jessica celebrates the miracle of life. When her daughter, Sophia, was born, she was not breathing and was in severe distress. Sophia spent three days in the NICU (neonatal intensive care unit) before she was able to be held by her mommy. Though the time spent in the hospital was very scary, it made everyone realize how precious life is. Now is your chance to win your own Lucky Girl Kit!! Link up your project for a chance to win!! What a great challenge! Love the projects this week! Oh how wonderful I am off to finish mine. Ladies thank you for all the inspiration! Ooooo, ladies these are all certainly stunning! 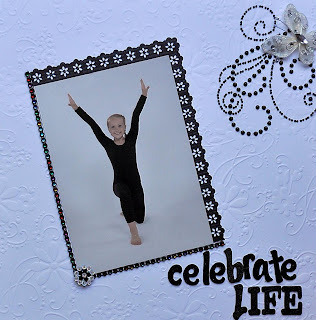 I love how we each tell such stories of celebrating life! I just loved this challenge. It was fun to sift through my stamps and find this gem of a sentiment. Everyone's projects are really beautiful and very inspiring.